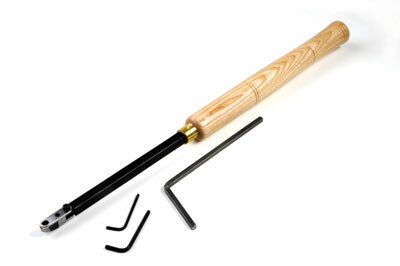 This tool has a square shank, making for a much more stable presentation to the work. In the shank there is a square hole into which fits a stabiliser. This locks into the shaft-adjustable position and rests on the tool rest at the same time as the hollowing tool thus allowing more support when cutting. The cutting tip - a modified and beefed-up version of a ring tool - is inserted into the end of the shaft underneath a cap/shield. 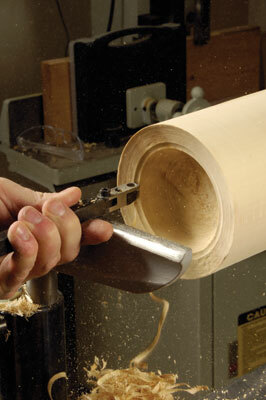 This type of arrangement is also known as a shielded cutter assembly. The tip assembly can be articulated to cut around corners but - and here is the big but - the shield is not the item that moves. Instead it's the cutter that is either pushed in to limit the possible cut or pulled out to expose more cutter for heavier cuts. This makes adjustment so much easier than some other tools on the market where one can adjust the cutter in and out or side to side. The HollowMate is deceptively easy to use. I used it on endgrain and side grain timber on samples that were both wet and dry, and of differing densities and coarseness of grain and was able to take a variety of cuts with ease. Sharpening is undertaken with a diamond slipstone and it's easy to follow the bevel and obtain a sharp edge. The maximum project size with this tool before one got a bit of cutter flutter was about 225mm (9in) without stabiliser and about 150mm (6in) deep with it in place, so it is capable of a wide range of project sizes. If you offset the head, I do recommend the use of the stabiliser arm as this irons out the tendency for the tool - as do all others with offset head from the shaftline - to rotate into the cut. I have used the word "easy" a lot in this report, and have to say that this tool was a joy to use. I think you too will find it very easy to use. For this type of tool I do not find the price of £79.95 prohibitive, and if you want to venture into hollowing I recommend you put aside preconceptions of how you think this type of tool works and give it a go. It is well worth looking at. "This tool was a joy to use"